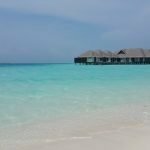 When it comes to booking holidays we’re down the travel agents or hammering on a computer to find the best deals to just get out of here and get some sun, sea and sand. I often completely take for granted that I live in one of the most beautiful and exceptional places in the world. On my doorstep (or at least within 20-30 minutes at max), I have all anyone could ever ask for in a home; I live near a sandy beach, we have the incredibly famous town of Cheddar where the best cheese in the world is made- which also comes with one of the most beautiful, natural landscapes to adore (The Gorge); I often get to take a drive down the most captivating countryside roads and marvel at the rolling landscapes. 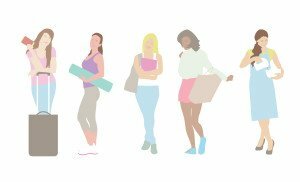 But equally, if I fancy a jaunt to the shops I have my pick of supporting local boutiques and farm shops or heading to the big shopping malls. Sounds idyllic, right? Even then, there is more to my ‘home’ than just what’s outside of my house. England, is a beautiful country that offers a traveller (whether home based, European or International) some of the most extraordinary sights to behold. I’m talking outside of London too- which is a popular destination for all for it’s architectural, history, food, culture and of course shopping. But when it comes to picking a holiday destination, I often forgo looking to what’s right in front of me. An ambition of mine though is to visit the four corners of the UK. To me, outside of London, one of the most iconic destinations in England to visit is in Cornwall, so I started my trip there. Holidays are always a bit of a mission for me, I always try and cram as much into my trip as possible to say I’ve seen it all, mostly because although I have the best intentions of always visiting again, with my travel list I am not sure it’ll happen. So as a precaution I read well around my destination and map out what it is I have to see. In the space of 2 days, I feel I pretty much got to take in most of what Cornwall has to offer. 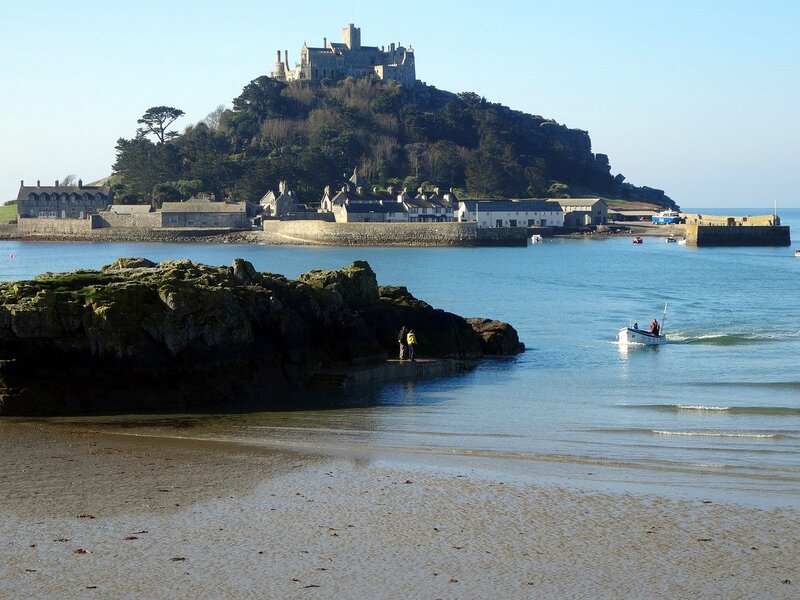 If you’re heading to Penzance, take a trip to visit St Michaels Mount! Is a typical British seaside town in most ways; you head into the main town and it’s crammed full of typical high street shops, places to buy your rock, taste the traditional cornish pasties and cream teas or pick up your fish and chips best enjoyed at the harbour. It also has plenty of arcades, a rich history- known mostly for its invasion of pirates, and a lido which overlooks the sea. To me, the town itself is too commercial and being one of the largest towns in the area, it’s very busy too. Whilst in Penzance, we recommend you hop along the coast to the small town of Marazion to admire the beautiful St Michael’s Mount. Accessible by foot at low tide or by boat when it’s high, the small island offers plenty of wonders to discover. Tread the pathways and explore the castle and gardens. Back on mainland you’ll find restaurants aplenty, a gorgeous, golden beach and the most gorgeous boutique finds- just leave plenty of space in your cases. Although, like Penzance, it is a large town, to me it feels more sparse.You’ll find a perfect blend of local artisan goods, high street retailers and quirky seaside shops- perfect for those holiday gifts and the much needed bucket and spade, all nicely spread out so you can enjoy a wander without the frustration. 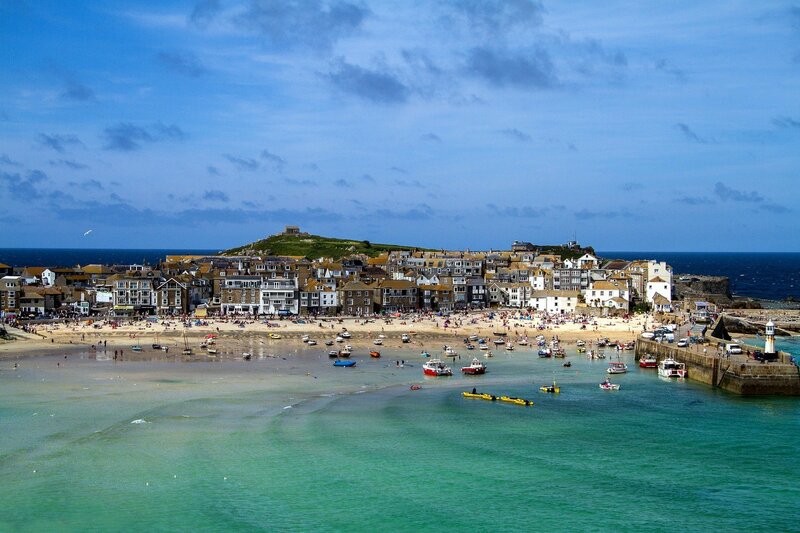 What I love most about St Ives is its picturesque beauty. To me, it is the British seaside town you imagine from the children’s stories. 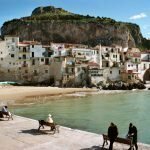 The sea is turquoise in colour, the white sandy beaches and the cute houses that hugs the coast are reaches up into the hills. This stop to will quench your seaside appetite and we highly recommend Pengenna for their traditional Cornish pasties and Becks for their fish and chips- although it is slightly out of the town, you can head to Carbis Bay to enjoy. If you’re looking for something a little more peaceful and tranquil then Porthcurno is the place to be. With a mediterranean style coast, you’re guaranteed some rest and relaxation in this spot. 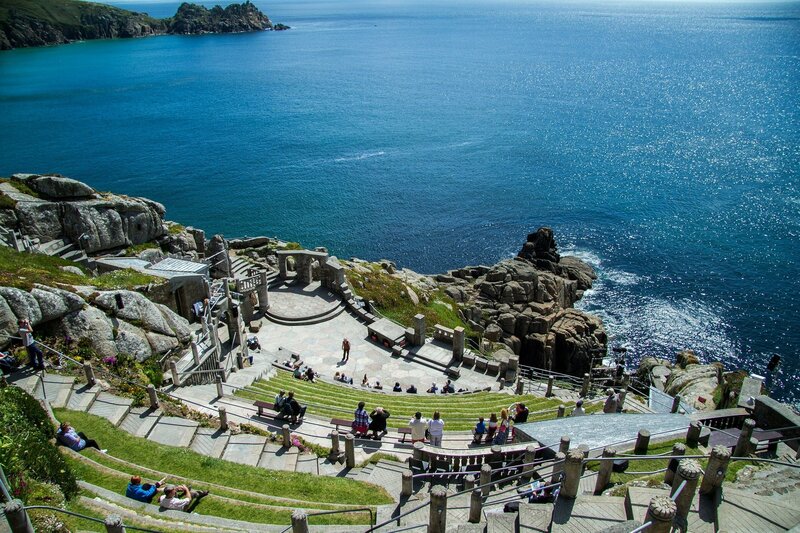 It is also home to the historic and most beautiful Minack theatre who still put on open air programmes throughout the year- it has an incredible story and is an ideal place to spend the day and simply enjoy the view, if you’re lucky you’ll even get a taste of the programmes they’ve got on. Is a British landmark and a location known mostly for being the most westernly point in England. 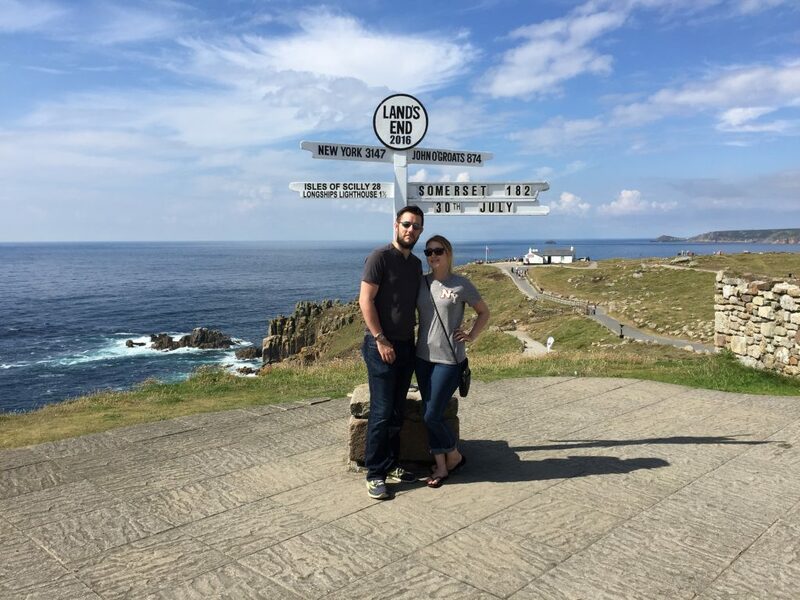 Many make the journey from the farthest point northeast, (John O’Groats, Scotland) to the Lands End sign raising thousands for charity in the process. There are some incredibly frustrating parts to visiting Land’s End: There is a fee to park your car, around £5, which is annoying but does go towards protecting the area and there is also a charge to have your picture with the very iconic Land’s End sign of around £10- this is because it isn’t an aspect actually owned by the destination but is a family run business. In addition to this there are a number of overcharged attractions- which appeals to children so expect a bit of nagging and overpriced foods and gifts. Despite this though, the exhibition on those who’ve made the journey from the northeasterly point to the farthest westernly point is free to explore and well worth doing and is truly inspiring. But most poignantly, it’s worth visiting this part of Cornwall for the breathtaking views it offers. Also there are interesting points of interest to take note of that include details of the many shipwrecks that have occurred here. So although you’ll spend a penny or two to be here, take along a picnic to save yourself a little and just sit back and enjoy what the coast offers. When it comes to travelling between the destinations I’d highly recommend taking the coastal route. 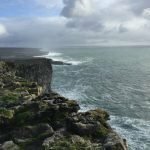 It’ll take you a bit longer to get to each stop but it’s totally worth it as you’ll enjoy some of the most spectacular views of the Atlantic ocean and get a true taste of the country lifestyle. You’re also likely to stumble upon some sites worth stopping- we found the best cream tea this way from Rosemergy Barn. 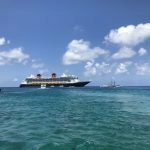 Have you been to these places before? Where would you recommend?